Electric vehicles are taking very important part in today’s Indian and national market. India aims to become 100% e-vehicle nation by 2020. DIESEL HAS TO DIE – THERE IS NO REVERSE GEAR ON THIS. 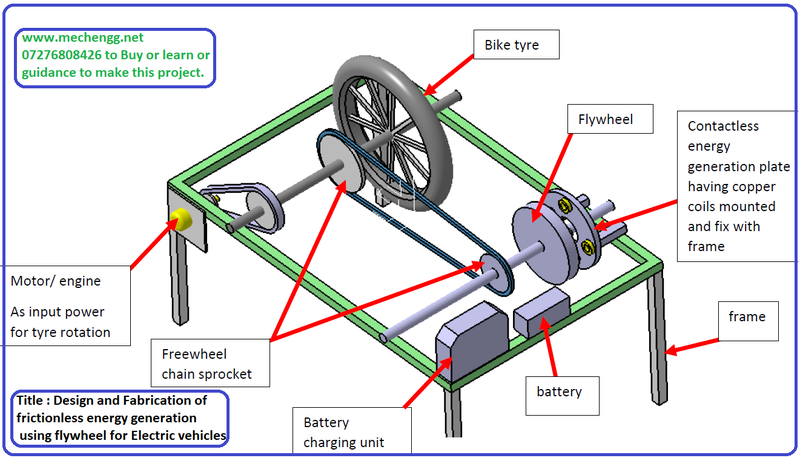 frictionless energy generation using flywheel is renewable . lots of people worried about the battery running out for battery car what to do then ? Frictionless energy generation using flywheel ? we are utilizing this rotary energy of flywheel to generate electricity . just small coin size magnets are placed on flywheel when Tyre rotates with flywheel Neodymium magnet will start rotating coil is steady. So here e.m.f is produce from magnet and coil arrangement. By this way power will generate and store it into batteries . Gear mechanism is not used in this project due to which friction is reduced. No fuel is required to run this project due to which no exhaust of pollutants take place.